One of our most beloved events! 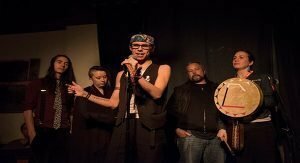 Jo Billows (Northern Coast Salish) pulls together a slamdunkin’ evening in honour of “East Van ghetto poet” Zaccheus Jackson Nyce (Blackfoot), the original curator of this event. This evening will showcase a variety of poets and poetic styles. Be prepared to laugh and be moved by their powerful words!